Our comprehensive neck therapy program treats patients who require neck therapy as a result of accidents, operations, chronic pain or patients who seek highly-specific neck sports injury therapy..
A muscle strain or spasm. Neck pain can also be a result of poor postural habits at work, whiplash injury. Strains while playing sports or stress related incidents in one’s life. All of our Qualified Physiotherapists have expertise in the assessment and diagnosis of musculoskeletal injuries. They employ the most advanced evidence based techniques and their results are sometimes instantaneous. Our Physiotherapists offer a broad range of treatment options such as soft tissue release, trigger point therapy, exercise prescription and joint mobilisation. As a result, they are in the best position to improve your overall strength, flexibility and range of movement, addressing any limitations you may have which may be contributing to your neck pain. Our team of highly educated Physiotherapists will provide you with advice andeducation. They will prescribe exercises for neck pain aimed at reducing the likelihood of it recurring while giving you tips on how best to reduce pain on a daily basis. Neck Stiffness is extremely common and is usually caused by injury to the soft tissue structures of the neck, such as muscle, tendon, ligament or joint.Muscle spasm in the neck, leading to a stiff neck, is usually a protective mechanism which is secondary to an underlying neck problem. This is referred to as ‘Acute Torticollis’ or ‘Wry Neck’. an undiagnosed cervical fracture (broken neck), or another neck problem. movement. The head will be held to one side and the neck is too painful to move. Attempting to move the neck will usually make the neck pain worse. In some cases, the pain will radiate up the neck or down to the shoulder area. There may be painful spasm in the neck muscles. which involves the Physiotherapist gently applying pressure to each vertebra in the neck in order to loosen them and allow a greater range of movement. Gentle stretching exercises ( exercise and movement ) may also be introduced to patient treatment to alleviate muscle spasm in the neck. Our Physiotherapists have a great deal of specific clinical experience in the management of neck related problem. Our team of Physiotherapists will use a variety of evidence based therapies and treatments to help reduce your pain and prevent recurrence. It is estimated that 50% of people experience tension type headaches. They are more common in women than men and are often seen in teenagers.Symptoms include a constant ache that affects both sides of the head, stiffness in the muscles surrounding the neck and/ or shoulders and often people report a pressure behind the eyes. 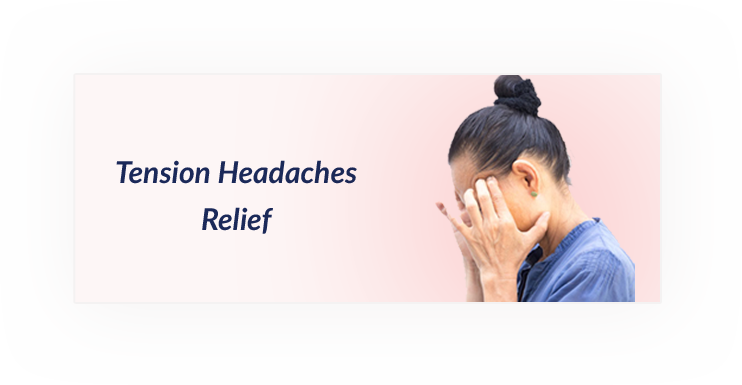 The exact cause of tension type headaches isn’t clear but certain triggers have been identified. Dry needling may also help to relieve your symptoms. Whiplash is an injury to the neck that usually occurs in a motor vehicle accident. It affects the soft tissue (neck muscles) but can also involve the spinal joints and ligaments, nerve roots, the jaw joints, and the upper, mid and low back. It is an injury resulting from a sudden extension and flexion of the neck. Average recovery time for a whiplash injury is a few weeks but may be longer depending on the speed and the position of the head during injury. The symptoms of Whiplash often take a while to develop and may not appear immediately. It may take as long as 72 hours for symptoms to appear.